HOUSTON - Joseph James Pappas II is Houston's most wanted man and he's the prime suspect in the high-profile murder of Dr. Mark Hausknecht. Pappas, 62, may have learned how to use deadly force as a deputy constable. His record shows he worked with Harris County Precinct 2 and Precinct 7. He was first paid for his services, and later was listed as a volunteer reserve. Pappas held an armed law enforcement job for more than 30 years, until 2013. Pappas is not married and has no kids. His friends called him "Joey" and he was living in the same Westbury home where he grew up. The home was raided Wednesday morning by police. Out of the well-kept home, Pappas runs a real estate brokerage under his own name. His neighbors said he is meticulous about his own home's lawn maintenance. Pappas also had a business application to run a concealed handgun instruction academy, so it seems he had certain skills with a gun. Although no criminal convictions were found, in Pappas' past there was perhaps an inkling of trouble decades ago. In a 1986 lawsuit Pappas filed against an employer, Channel 2 Investigates found an odd excerpt: Pappas was characterized as a loose cannon who was "barred from attending meetings ... because of various inappropriate activities," the lawsuit read. Pappas owns an old police car -- a Ford Crown Victoria -- but he did not take that car with him because police found the cruiser at his house. 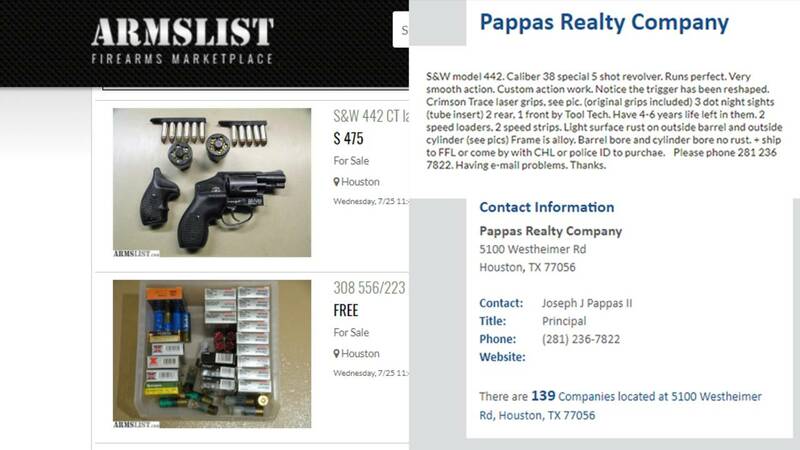 On the website ARMSLIST.COM, which is a website that private citizens can sell weapons to other people, there are several listings where the contact phone number for the items is the same contact phone number for Pappas Realty. Several items were listed for sale on July 25. Hausknecht was shot and killed July 20. It is not clear if any of the items for sale were used in the crime. Listings appear to have been posted by the man accused of shooting a Houston doctor to death.